Silane Guard compounds the new ingredient: silane. By this compounding technology, it can sustain the strength of coating as ever; and moreover, it can make the surface of the car be super smooth to the touch as never before. The coating lasts more than one year. No need to do any special care. Daily shampoo is enough to maintain the coating. 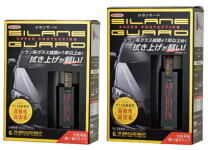 With Silane Guard, coat your car like pro by yourself!